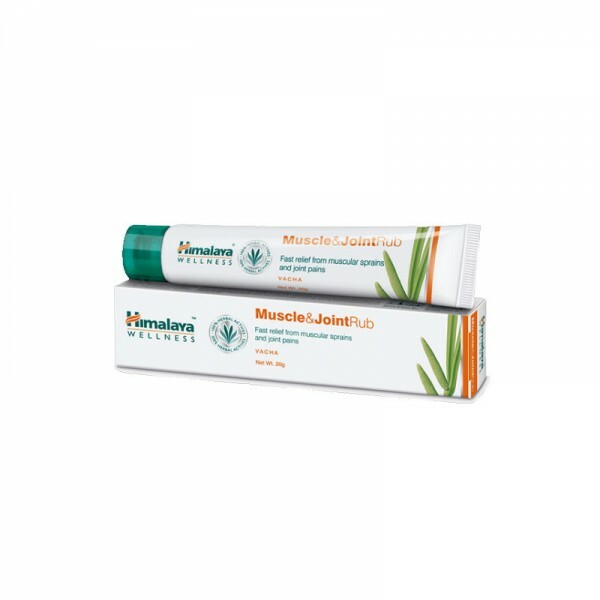 Himalaya's Muscle and Joint Rub is highly effective for backaches, muscular sprains and joint pain. Enriched with Sweet Flag, Castor Oil, Red Pepper and Spearmint, it alleviates swelling, sprains and muscle and joint inflammation. Red Pepper contains pain relieving and anti-inflammatory agents, which soothe sprains. Five-Leaved Chaste Tree leaves reduce joint swelling in arthritis, and its extract is an excellent pain reliever. The counter-irritant properties of Spearmint are useful in treating muscle and joint inflammation. Tasmanian Blue Gum Tree Oil and Sesame Oil are known to be potent pain relievers. They also help reduce joint swelling. Holy Basil possesses anti-inflammatory properties which significantly reduce inflammation and alleviate joint swelling. Sweet Flag improves blood circulation and alleviates swelling. It relieves pain and inflammation. The counter-irritant properties of Castor Oil alleviate joint pain associated with rheumatism and osteoarthritis. Black Pepper relieves pain and reduces nerve inflammation. Musk Root Oil extract is an effective sedative for the nerves. Massage gently over the affected area. Simultaneous hot water fomentation provides optimal results. A clinical study was carried out at Bowring and Lady Curzon Hospital in Bangalore, India, to evaluate the efficacy of Himalaya's Muscle and Joint Rub on muscle sprains, contusions and inflammatory musculoskeletal disorders. One hundred ambulatory patients of both sexes, with clinical symptoms of either muscle sprains, contusions or inflammatory musculoskeletal disorders were enrolled in the study for two weeks. This study observed a significant improvement in muscular pain, joint swelling, joint tenderness, joint stiffness and range of movement after a week's therapy, and all the patients experienced complete relief at the end of two weeks of treatment. No clinically significant adverse reactions were reported, and the overall compliance to the therapy was excellent.